Jim Hinkson has spent most of his life surrounded by sports, having coached basketball and lacrosse, as well as played hockey around Durham Region. 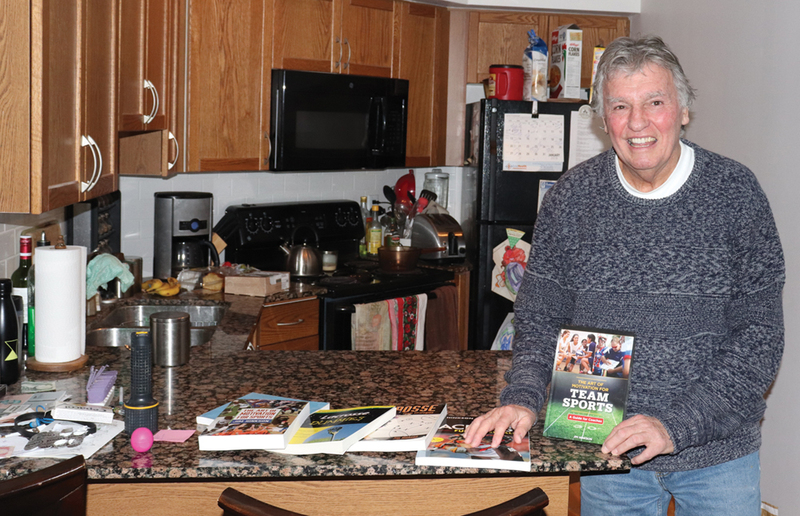 Hinkson recently came out with his 12th book on coaching titled, the Art of Motivation for Team Sports, a book he describes as his best yet. He has received several honours throughout his career, including the Queen Elizabeth II Diamond Jubilee Medal in 2012. The award goes to those who have made significant contributions and achievements while representing Canada. “It was an honour [winning the medal]. It’s nice to be acknowledged,” says Hinkson. He was also inducted into the Oshawa Sports Hall of Fame in 2009, while also being inducted into the Whitby Hall of Fame in 2006, and the Canadian Lacrosse Hall of Fame in 2000. Growing up on a farm in Oshawa on Bloor Street, which he says his family eventually sold to General Motors, Hinkson says he went to Oshawa Central Collegiate for high school, where he jokes he set a record after spending eight years in high school. While in high school, Hinkson notes that he was playing junior A hockey, and lacrosse. Hunkering down, Hinkson finished high school and moved on to Sir Wilfrid Laurier University as a mature student, where he took psychology. A late bloomer, he didn’t play lacrosse until he was 19, but he immediate found a love for the sport. In fact, nine of his 12 books are on Canada’s national summer sport. Hinkson played for 12 years, ending his playing career when he was 31. During his career, he went to a total of 10 national and professional championships, and he won six. Hinkson says he started out in 1963 playing for the Oshawa-Whitby Juvenile Green Gaels where he won two junior “A” Canadian championships. He says his best championship season came when he was picked up by the Peterborough Lakers of the Professional Lacrosse Association in 1969. Hinkson would then go on to be the player-coach for the Windsor Clippers and Windsor Warlocks, followed by time with the Philadelphia Wings, while also representing Canada at the World Field Lacrosse Championships in Melbourne, Australia in 1974, his final season as a player. Overall, he coached for 40 years starting in 1965 at 21 when he coached the Whitby Lasco Steelers. Something else he says he learned isn’t that sports builds character, but reveals it instead. As a coach, Hinkson didn’t fully take on coaching until his playing career ended, and he coached the Philadelphia Wings of the National Lacrosse League in 1975. From then on, Hinkson also coached the Rexdale Warriors: OLA Jr. A (1976 to 1977), the Whitby C.B.C. Builders: OLA, Jr. A (1978), the Whitby C.B.C. Builders Jr. A Lacrosse team (1980 to 1981), the Whitby Midget “B” team (1998), the St. Catharines Athletics Majors (1999, 2004), the Toronto Jr. A Beaches lacrosse team (2000 to 2001), the New York Saints (2000), the New Jersey Storm (2002), the Vancouver Ravens (2003), and the Akwesasne Thunder (2005). Hinkson won the Coach of the Year Award in 2000 for the Toronto Jr. A Beaches lacrosse team, won two Canadian championships, and was a finalist twice. However, Hinkson wasn’t just a lacrosse coach, as he also coached basketball at Stephen Leacock C.I. in Toronto for 38 years. Hinkson says he never played basketball, but he was able to learn about the sport through reading, as well as attending several major camps in the U.S.
Hinkson says he was inspired to begin writing when he was attending Althouse College in London, Ont. to become a teacher. After that, Hinkson’s first book titled Box Lacrosse came to be in 1974, andthe words began to flow as Hinkson added another 11 books to his repertoire. “So going to Althouse was good because of the fact I started writing,” he explains. “The thing is I only got, I think, a B+ on my paper which really ticked me off,” he says with a laugh. He says after that, writing became a hobby, and he wanted to know how other coaches motivated their players, so he researched and read, and even to this day in retirement, he’s reading the same type of books he would have been reading in college. These days Hinkson is retired from coaching and teaching, and is focused on his latest book, as well as spending time with his family. Hinkson has a brother who lives in Andorra, who was the first entertainment lawyer in Canada. He worked with bands such as Rush for 15 years before he decided he was tired of it and moved to Andorra. Now he is a singer who records music of his own and he goes by Will Hinkson. Hinkson also says he had a sister, but she passed away recently. His focus today is on his three children. His oldest, Maggie, played field lacrosse at Western University in London, Katie, his middle child, played field lacrosse at Brock University, and James, his youngest, he went to Sacred Heart University in Connecticut on a lacrosse scholarship. He jokes that he met his wife because she was a psychiatric nurse and he was her patient, but he says they actually met at the Holiday Inn in Oshawa and were married after only a few months. They’ve now been together for 45 years. Hinkson says they do a lot of traveling, and they’re currently excited because they have a cruise coming up, and they’ll be going to Florida as well. Sports have always been a great passion of mine, especially baseball or hockey – I’ll even pay attention to sports I don’t watch like basketball and football. However, I don’t know much about lacrosse, a sport so Canadian it was here before hockey. So interviewing Jim Hinkson, a former lacrosse player and coach who is not only in the Oshawa Sports Hall of Fame, but the Whitby Sports Hall of Fame and the Canadian Lacrosse Hall of Fame as well, was eye opening. His story of growing up on a farm in Oshawa, and becoming one of the premier lacrosse coaches in Canada was a story I felt was worth telling. Jim has also written more than 10 books in his life on coaching, most of which were focused on lacrosse. As a writer myself, to see not only his longevity in the field, but also his patience in taking the time to write so many books, while also still researching his “hobby” in retirement, is something to behold. Jim is also a family man, who lit up as he spoke about meeting his wife, as well as his two daughters and one son, in a way only a husband and parent could while talking about their children. As someone who comes from a family of teachers (of the four of us, my brother is currently teaching French in London, and my mother is a retired music teacher), to know that someone who worked as a teacher was not only able to have such a lofty career as a coach, but was also able to have a family, is truly inspirational. Meeting Jim also goes back to my desire to better understand Oshawa and its history, as meeting him gave me a glimpse into the history of sports around the city, and provided me with an opportunity to meet who I believe is a true Oshawa legend. Now in his retirement, Jim has lived a full life many of us can only dream of having.